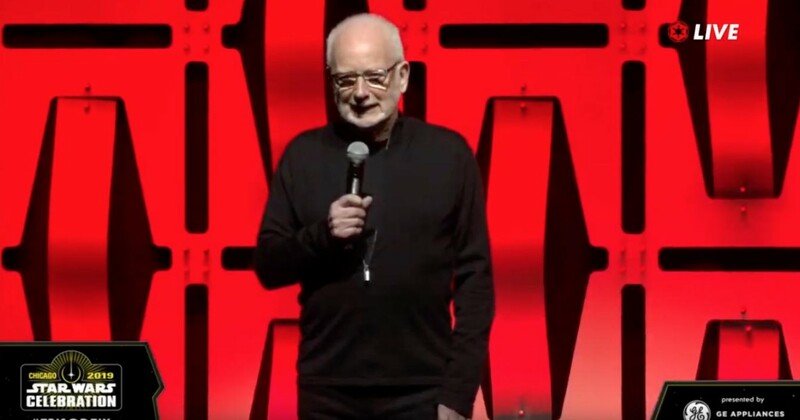 Actor Ian McDiarmid explains and reacts to the surprise reveal of the Emperor at the end of the recent trailer for Star Wars: The Rise of Skywalker while attending Star Wars Celebration where he downplays the insidious laugh. "As you know in Star Wars, they are very good in dealing in unexpected moments the whole time. Secrets are a big thing and nobody ever really knows what anybody else is doing. That's always been the story of the pictures... An area of mystery is always a great thing to have when you are telling a story. That certainly continues, apparently," McDiarmid teases. "J.J. Abrams is a marvelous director and an interesting man. He also likes a good tease. So I was very happy to be a part of the tease the other morning." Similar to many fans own reaction, McDiarmid was just as blown away. "I was almost literally blown away back into the wings," McDiarmid says about fan reaction. "No. It was fantastic. But it was nice to just walk on and say absolutely nothing except the phrase 'roll it again' in his voice." Interestingly enough, McDiarmid continues with talk about the title where he mentions "Skywalker" in the plural (which may just be a slip of the tongue, but the title was once rumored to be "Skywalkers") and also that the laugh is not from new footage. "Like everybody else, I had no idea what the title was," Ian McDiarmid explains. "They did let me into the secret that the Emperor might be laughing, but I have to tell you that that particular laugh was not specially recorded, they found it somewhere. Probably from one of the old movies or in a digital vault or maybe George's iPhone, I don't know. What I liked about it though, that's why I think it is a real tease. I mean the new title, 'Rise of the Skywalkers' is wonderful, and then from the past, maybe from hell, a laughter comes, which sort of implies [Emperor voice] 'yeah, right.' In other words, 'Skywalkers rising?" I don't think so." Ian McDiarmid continues teasing that maybe laugh doesn't mean what fans may be thinking about the character and movie. "We love the mystery and we love the great moments of revelation, and people seem to think we had one the other morning, which surprised me. The headline of the whole panel and indeed the trailer is the word 'tease.' So don't take it too seriously. Have a laugh about it," he says. While Ian McDiarmid is being rather mysterious about the return of Palpatine, it has been reported that J.J. Abrams confirmed the return of the Emperor for Star Wars: The Rise of Skywalker.